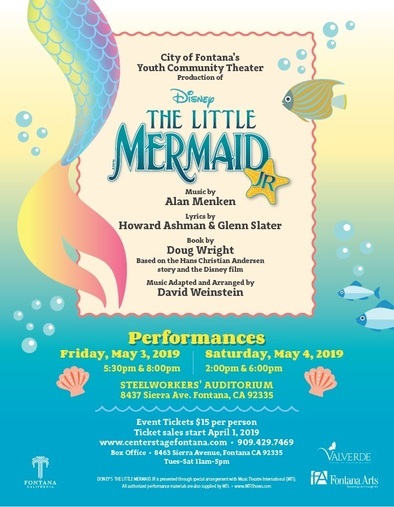 Fontana, Calif. - Join Flounder, Sebastian and other lively characters as the story of Ariel comes to life in Disney’s The Little Mermaid Jr., performed by the City of Fontana Youth Community Theater. Performances will be held at Steelworkers’ Auditorium (8437 Sierra Ave.) on Friday, May 3 at 5:30 p.m. and 8:00 p.m., as well as on Saturday, May 4 at 2:00 p.m. and 6:00 p.m. Tickets are now available for $15, and can be purchased online, by calling (909) 429-7469 or in person at the Center Stage Box Office (8463 Sierra Ave). Enjoy the show, and support the young and talented performers of Fontana as they retell the classic tale of The Little Mermaid who longs to live in the world above. The play features music by Alan Menken, whose film musicals include Beauty and the Beast, Aladdin, and Pocahontas. The performance will also feature beloved classics from the Walt Disney Motion Picture “The Little Mermaid” including “Under the Sea” and “Part of Your World”. The book, “The Little Mermaid” is written by Doug Wright, based on the Hans Christian Andersen story and the Disney film. Purchase your tickets today at the Center Stage Theater Box Office, open Tuesday through Saturday from 11:00 a.m. to 5:00 p.m. or online at www.centerstagefontana.com. For more information, please visit the Fontana Arts page or call (909) 349-6949.